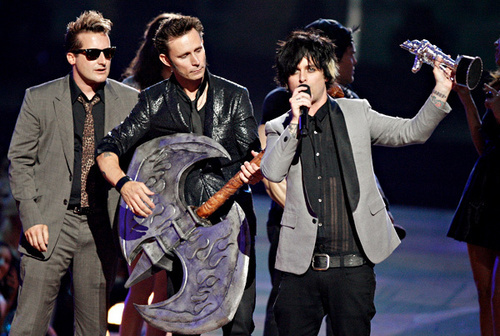 Green Day Accepting the 2009 MTV VMA for Best Rock Video for '21 Guns'. Green Day Accepting the 2009 MTV VMA for Best Rock Video for '21 Guns'. Wallpaper and background images in the Green Day club tagged: green day billie joe armstrong mike dirnt tre cool winners accepting mtv vma 2009 best rock video. This Green Day photo might contain concert.